Presence of poison ivy or poison oak in your backyard must be removed immediately. Don’t ignore that itchy vine that invades your garden. Accidental contact of humans may cause terrible, itchy, blistery rash, caused by the presence of urushiol in the plant’s stem and leaves. Maybe you’re now asking how to get rid of poison oak around your home or backyard? Well, I have here some helpful tips that will guide you to effectively remove the toxic plant. First, dress up properly. Don’t leave any exposed skin. As much as possible always wear rubber gloves, a long-sleeved shirt, long pants tucked into socks, and boots or shoes that can be hosed off later. Also, include goggles and mask to cover your face when removing poison oak. Next, prepare for the battle. 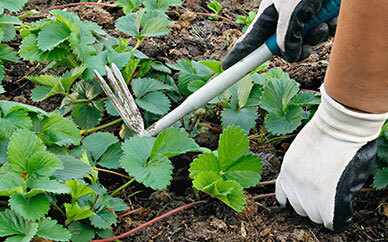 Try pulling the plants or cut the stems to ground level. Make sure not to tear or rip the vines, as they may disperse the toxic into the air. Dig the ground to get all the roots. Watch for the “runners” – roots that will reach beyond the edges of the covered area to sprout. Immediately dispose it into a garbage bag for garbage collection. Never burn poison ivy as the oil can be spread through the smoke, and don’t compost it, either, because you don’t want it popping back up in the garden. Moreover, you can also apply herbicides as an effective way of getting rid of poison oak. Using these chemical weed killer, you must follow the directions on the label for safest use. Finally, immediately washed all your clothes and tools in contact with poison ivy. Disinfect all of them using a degreaser, alcohol or vinegar to thoroughly remove the persistent oil (urushiol) – the oily allergen in the plant. These are the tips that I follow when I’ve noticed the presence of poison ivy in my backyard a year ago. Another tip that I didn’t mention is pouring hot water onto the roots for several times to completely destroy the hidden roots. Take extreme precautions before doing the task to eradicate the poison oak safely in our home or backyard.